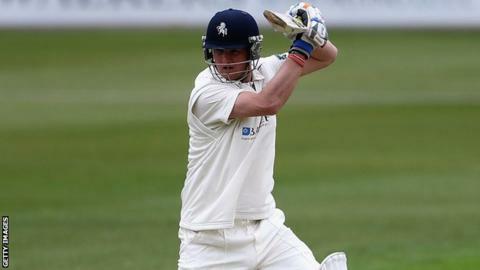 Matching centuries by Brendan Nash and Rob Key put Kent in a strong position at the end of day two against Surrey. Surrey resumed on 276-8, adding just nine runs to their overnight total. Key and Nash then both scored 126, putting on 197 for the third wicket as Kent reached 355-4 at the close, surpassing Surrey's first-innings 285. It was a disappointing day in the field for Surrey, with the hosts 100-0 before opener Sam Northeast (53) was caught by Aneesh Kapil off Stuart Meaker. After Key's wicket fell just before the close of play, Kent will resume on Tuesday with Ben Harmison and Darren Stevens looking to extend their lead. "The Canterbury Bank Holiday patrons were treated to a batting masterclass from Brendan Nash and Rob Key. "Both scoring centuries, they added a quick fire 197 for the third wicket and took this game out of Surrey's immediate reach. "It was a day for batting in the sunshine and this was batting at its best. Kent are in the driving seat." "An excellent day for the hosts built around the third-wicket partnership between Rob Key and Brendon Nash. "Both centuries that were full of experience and class. "With Kent already leading by 70, Surrey have some work to do on day three to keep themselves in the game."